IP video is more affordable than ever and is really the best choice for entry into the video surveillance market or when considering a system upgrade. As technology improves— H.264, camera side motion detection—installed camera costs are no longer in the $2,500-plus range, and they aren’t just less expensive, they are better than ever. A centralized configuration with servers in a data center is also less expensive in the long run for your large or even mid-scale IP video camera installation. In fact, we have seen examples where there is a 50-75% savings on the server infrastructure—literally translating into hundreds of thousands of dollars in savings. And did I mention the ability to achieve more than 200 cameras per server? Traditionally, a video surveillance setup would consist of having a location, a school, for example, with video surveillance cameras in the parking lot, entrances, cafeterias, etc., connected to servers at that physical building location. It was done this way because at the time it was most efficient to keep the bandwidth local. This type of system would allow for central viewing, but it is still a very localized and decentralized configuration. Let’s say I have a school district with two campuses and each has 150 cameras. 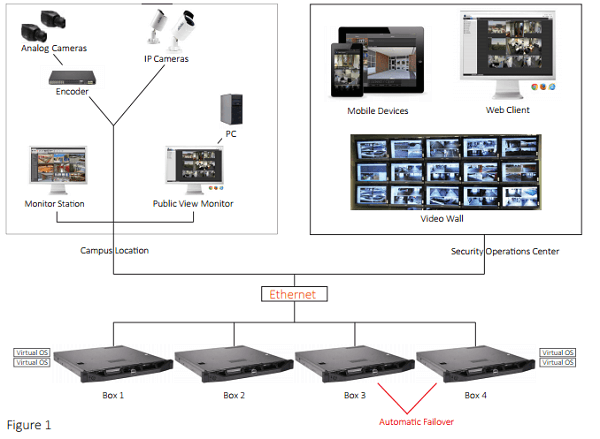 In a traditional DVR world they would have 10 16-camera DVRs at each campus. It’s a pretty significant infrastructure, right? So perhaps they changed to 32-camera DVRs in order to cut the number of servers in half. Then they decide to get encoders and put a couple of NVRs in this configuration, achieving 64 cameras on each NVR. Yet, they start to look at what H.264 does to bandwidth and they begin evaluating available bandwidth. One hundred and fifty cameras creates a lot of bandwidth in a JPEG world, but it doesn’t create near as much as you might think in an H.264 world—even if it’s 2 megapixel resolution because the bitrates are really relatively low per camera. As an example, the bitrate of a 2 megapixel camera running at a normal resolution (normal quality, normal frame rate) for most installations could be 1.5 megabits per second. If I have 10, then I’m using 15 megabits per second. That’s not that big in today’s network. Typically there is a 1 GB connection or more between the campus and the data center. Having a series of cameras, it may be that I’m using 150 megabits or even 300 megabits of the 1 GB connection, and that’s kind of an extreme connection, but I’m going back to a central server. That central server is using a shared infrastructure. That server is in a rack, using air conditioning, power, and networking gear that all of the other systems use, as well, so it is not having to be separate and a duplication of costs. The servers today have dual power supply, RAID storage, dual processors and more. These machines are so powerful in 1U and 2U configurations that it’s very easy to have 200 cameras on a single server. That definitely beats having 10 DVRs—or even two NVRs—at a campus. Why The Move To Centralization? For years video management software (VMS) developers had to deal with the limitation of when an image was received at the server, it had to be decompressed and checked for motion. Most of the cameras that have been built over the past few years, however, support camera-side motion detection meaning the camera is doing the work. The camera captures the image and the image comes back to the server with a little flag that says “keep this.” This results in very little work by the server, which just has to save it. In a centralized environment, you can have RAID storage subsystems that are super efficient—they take all of the work away from the computer. As a result, you start having camera counts increase even though image sizes are increasing. Part of this is also due to the ability for a VMS developer to optimize camera communication methods, which to date hasn’t been very efficient. The combination of changing the way we talk to the camera, camera-side motion detection, and H.264 compression allows us to have incredible density. Instead of having three or four servers at a high school you can have one or more back at a data center. The compression of the cameras using motion detection coming over the network is so low that you might even have (as I have seen frequently) an organization with 50 locations running their entire system on 10 or fewer servers. It’s also safer from a backup perspective as the centralized failover mechanism is strong. You have dedicated systems whose only job is to stand by and watch if any of the boxes fail in which case they automatically failover to a dedicated machine in the group (see Figure 1 above). From a commoditized perspective, centralization is a sound investment. A 2U rack with 24 TB of storage in a RAID configuration with a dual processor and dual power can be purchased for typically $10,000-15,000 from most manufacturers. That single box can support literally hundreds of cameras. Plus, you are using your storage more efficiently among several locations on a total sum basis rather than on a building-by-building basis. Centralized data centers are nothing new as they have been around for many years. A data center might have 2,000 square feet dedicated to racks, power, air conditioning—big units all set up for hundreds of servers. What has happened, however, is that these servers—the processors—became so powerful that a single application was not utilizing the full capacity of the box. Vendors like VMware, Microsoft Hyper- V, and Xen began running multiple copies of the Windows Operating System on a single box, or running Linux and Windows in a single set of hardware, making it virtualized. So, instead of having 10 servers, I might have five servers with each server running two Windows applications. Windows can only support x amount of activity and x amount of memory, yet the box itself can support an even larger amount—therefore we maximize efficiency by using the tool of virtualization. The data center that once had 150 servers now shrinks down to two or three racks due to virtualization. This scenario of consolidated equipment is more manageable from a technology and maintenance perspective and results in reduced power and more environmentally friendly conditions. Virtualization also creates wonderful methods of backing up and redundancy via the failover discussed previously. There are many products in the security space—Intransa, Pivot 3—which use virtualization as a way to create failover, providing a pretty exciting dynamic especially if you think about it from a centralization perspective. There are some important questions to consider prior to moving to a centralized deployment. bandwidth — For a centralized deployment you will have to have the proper connectivity and bandwidth between campuses/buildings back to the data center. The reality is that bandwidth is increasing dramatically because the cost to drive out to a facility is so much. The cost of having multiple servers routed to an organization at different campuses is so expensive that it’s considerably cheaper just to bring it all back to the data center. There is also the concept of what other systems will use the infrastructure. With VoIP replacing local PBX’s, there is a big push to have high speed out to campuses for many reasons. But the key question regarding centralization and bandwidth is what your maximum bandwidth capability is verses what your normal bandwidth will be under routine camera usage. IT Bias — To successfully pull off centralization you have to be IT oriented. You have to have the ability to run nonproprietary hardware, support the various operating systems, and support concepts like virtualization and open architecture—these are just necessary components. Analog — If you have existing analog cameras and want to add IP cameras to the system in a centralized configuration there is always the discussion of, “Should I just throw away the old analog cameras or should I continue to leverage them?” The addition of video encoders gives analog cameras new life by capturing those images at a higher resolution and at a higher frame rate with a de-interlaced image. The good news is that you can keep your analog cameras and by using encoders put them on the network for a fully-centralized deployment. If you are evaluating your current video surveillance system or are in the market for a new one, the ability to centralize should be a key factor in your solution. The benefits of a centralized deployment include reduced capital investment, reduced maintenance costs, a robust redundancy and a leveraging of your existing technology infrastructure. With the right VMS and a centralized configuration there are no limits to the number of cameras you can put on a server as it relates to the traditional restrictions of 16, 32 or 64 cameras.